We are often asked the question of whether cheap fuel is a false economy and our response is a resounding YES! The price difference between the two fuels at the bowser doesn’t translate into hip pocket savings because ethanol has less energy per litre than petrol, meaning you need to use more of it to achieve the same outcome. Drive put the three fuels to the test, driving three identical Toyota Camrys more than 2000 kilometres in a range of conditions to see which fuel drives your dollar further. The E10-fuelled Camry in the test cost $276.55 to run, while the regular unleaded version cost $271.56 and the premium unleaded fuel version, which cost, on average, 15 cents a litre more than E10, cost $285.54. The car running on premium unleaded consumed 9.06 litres/ 100km, compared with 9.41L/100km for the regular unleaded car and 9.81 litres for the E10 vehicle. The test-drive route covered a range of conditions, from freeway driving to off-peak and peak-hour city driving. City driving exposed E10’s efficiency shortcomings more than highway cruising. Around town using E10 was almost as expensive as using premium unleaded, despite the huge gap in pump prices. In the700 kilometres of city driving, our E10 Camry used almost 10 litres more fuel than our premium-fuel car. The comparative fuel bills for the three cars were: E10, $105; premium, $105.91; and regular unleaded, $100.33. Below is another article that explains the differences in more detail. What does the RON number mean in regard to petrol? Unleaded fuels carry a RON (Research Octane Number) rating. Put simply, RON determines petrol’s ‘anti-knock’ quality or resistance to pre-ignition; or if you want to put in another way, the Octane Number denotes its resistance to detonation. If you run your vehicle on low octane petrol you might notice a ‘knocking’, ‘rattling’, or ‘pinging’ sound (as it’s often called), which means the fuel is detonating instead of burning smoothly. This is not only a waste of energy, but it can also damage your engine in the long run. Burning is the desired effect of any internal combustion engine (not an explosion per se). Fuel with a higher octane number suitable for your vehicle’s engine will eliminate knocking. Older cars that were designed to run on a lower RON fuel can also benefit from a higher RON, because the older the car and the higher the kilometres, means the engine will have a greater propensity to knock. This is mainly caused by a build-up of contaminants and carbon deposits which, when hot, can cause pre-ignition. Rotary engines suffered from this too. As carbon deposits build up on the three apex seals of each rotor, the deposits get so hot, they glow orange with heat and then bang…detonation! If you’ve ever seen an apex seal with what looks like burnt, corroded and ‘blown’ corners, you’ll know why. So in effect, a higher RON fuel when used in these situations will have a much higher threshold to detonate, therefore reducing that nasty characteristic of detonation. There may have been times when you’ve pulled up at the petrol station (and apart from feeling like you have just been violated when paying for your go-go juice) and thought to yourself: should I perhaps try XYZ fuel? Is it any better? What should I be using, and could I be using the wrong thing? Let me quickly go through some basic facts about available fuels. ULP was produced to replace older-technology petrol which used lead-additive as an upper cylinder lubricant (use of lead was phased out in most countries because of the damaging effects of lead on our health). Vehicles using ULP operate with a catalytic converter. Most vehicles built or imported since 1986, and a number of pre-1986 vehicles, have been fitted with catalytic technology. ULP has a Research Octane Number (RON) of between 91 and 93. If you have a low mileage car, that isn’t a performance car, there is no need to extend your wallet to anything else but this stuff. It will do the job just fine, especially if the manufacturer of your motor vehicle recommends it. But you may wish to consider the following when making your choice. PULP is a special blend of petrol with a higher octane rating, that can produce higher engine power, as well as knock-free performance for unleaded cars with a high-octane requirement. So yes, it does give you more performance, and, because it has a higher tolerance towards ‘knock’, it may stop your engine from retarding, assisting the car to run at its optimum. PULP, usually has a Research Octane Number (RON) of 95/96 and as time goes on, PULP is starting to become the norm. As discussed earlier, perhaps higher mileage and older cars will benefit from running a higher RON to reduce knocking. Of course, if the manufacturer recommends you use 95+ RON fuel, then do that. As it burns cleaner, and more completely, and can extend the number of kilometres you get out of each tank, there are good environmental reasons for choosing a higher octane fuel. Most oil companies have a specially-named version of UPULP (Castrol Vortex and BP Ultimate are two examples) which has a RON of 98. It is a high-octane unleaded fuel that maximises engine power and performance, burns cleanly (keeping the upper-cylinders clean) as well as producing less pollution. It is more commonly recommended for imported and high performance vehicles. 98 RON is promoted as providing excellent fuel economy. It has low levels of benzene, sulphur and lower aromatics: its sulphur content is 10 times lower than the national standard for unleaded fuels. For performance cars, 98 RON go-go juice is the norm. But does a car that is designed to run on 95 RON fuel run better on 98 RON fuel? Some swear by it, but from what I have seen, I have no evidence to sustain that theory. Sure, you may get better mileage, but I am skeptical that we would see measurably positive results on the dyno. However, there are certainly exceptions to any rule, and there are just so many variables to consider it’s not worth turning the discussion into argument. 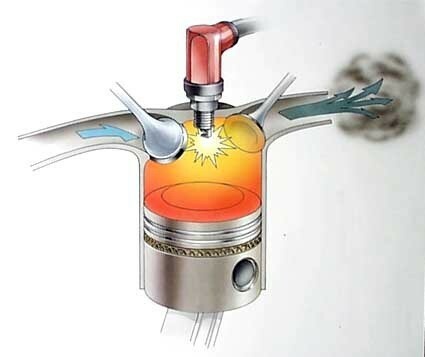 The basic principles of internal combustion technology in cars has changed little; where things have changed however is in programming and in the sophisticated fuel management systems (such as knock sensors) of modern cars. Some engines are fitted with a device called a knock sensor. Regardless of whether your vehicle has a knock sensor or multiple knock sensors, if it has high mileage, a higher RON fuel would be the most mechanically sympathetic thing to do. Why is that? You see the knock sensors in your engine (if equipped) have a job to do. They protect your engine from knock by retarding timing; but here is the thing – your car ‘has’ to knock first before the knock sensors can do their job! This is not a good start in the first place. When an engine ‘knocks’ the engine temperature soars, and with most modern engines using an all alloy block, heat is bad… very bad. Older engine blocks were commonly made from iron, and iron has a much higher melting temperature (at around 1,500 degrees centigrade) whereas an alloy block (we’re generalising here) melts at around half that temperature (being approximately 800 degrees centigrade). Having first-hand experience with race engines that run an engine management system like a MOTEC tuned for a race fuel like ELF W.L.F (World Rally Fuel) at 102 RON ( the FIA limits for racing fuel is 102 octane), I’ve seen an engine ‘melt’ internally after just getting a ‘whiff’ of 98 RON when the engine was tuned for 102. Temps went through the roof and the engine was a throw-away proposition. This gets pretty expensive, let me tell you. Of course this doesn’t happen anywhere near as dramatically with passenger cars built for consumer use, and most race engines don’t employ knock sensors to retard timing. It does however illustrate – at the higher end of the spectrum – just how important running the right RON for an engine can be and just how serious knock is. So what does all this RON nonsense mean to the average motorist? Does it give you more power like many people suggest? Can you really ‘feel’ that extra power via the driver’s seat? Does a higher RON fuel equal better fuel consumption? The answer to these questions is somewhere between “maybe” and “yes”, but it depends a lot on your car, its state of tune, and how you drive. So what do you next time you find yourself at the petrol pump? My advice is reach for the better stuff. Not only are you “spreading the love” to your engine, but you will likely see better mileage and you will be doing your bit for the environment. On the whole, the higher the RON, the cleaner the emissions. Till next time, Happy and safe motoring. We’re still here! Cathy & Martin have rebranded Faranda Automotive as SVS Autocare South Brisbane. Same great service, new name and website!